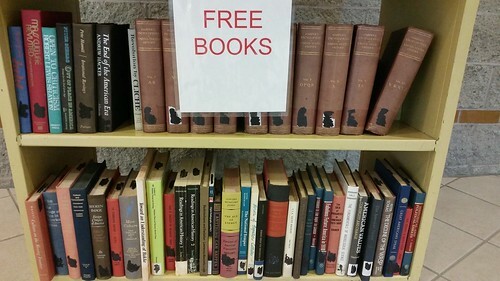 A bookshelf of free books that the library has cycled out of its collection. I pass by this bookcase regularly. Sometimes, there are a lot of books, sometimes there are few. The librarians are regularly taking books out of circulation that haven't been used in quite a long. Looking at the shelf in some ways reminds me of why I blog. Some people think blogging is a bit ephemeral and useless. You write a lot of posts that are "published" that go into the ether and you rarely know if anyone has ever read or been moved by what you wrote (they occasionally comment, but much more often, you see your stastics and wonders what it means). Yet, I still enjoy it and find meaning in it. I think the thing is that people are sometimes asking about blogging contains a bit of a comparison to supposedly more legitimate forms of writing like books. But this bookshelf reminds me that even those books may exist on shelves for years with no one to pick them up and will eventually end up on this shelf. Either to be taken home by someone or put into the recycling bin. No matter what the form, you may never have a readership. By blogging, I have the opportunity to write as much as I want without the sometime tedious process of publishing physical texts.